The road to get both Mickey Mouse and Oswald the Rabbit on the same screen was a unique one. The path to "Epic Mickey" and this year's "Epic Mickey 2" was far from your typical Disney adventure, ultimately involving the trade of a legendary sportscaster for an obscure cartoon character. Disney knew their video game franchises needed a splash of color, and so to refresh their palette they went back to their black-and-white roots. In 2004, a couple of interns had a far-fetched idea: bring together one of Walt Disney’s first creations, Oswald the Lucky Rabbit, with his most iconic. Oswald, originally created for NBC Universal by Disney and collaborator Ub Iwerks, appeared in more than two dozen shorts in the late '20s, but had faded into obscurity by the mid-'40s. Decades later, when ABC, a parent company of Disney, lost the rights to "Monday Night Football" and NBC was getting their "Sunday Night Football" underway, a top-flight announcer was a must. ABC had one in Al Michaels, and NBC had the rabbit that hadn’t been used in more than 80 years.The trade was made. In the “Epic Mickey” video game, Oswald is the game’s reluctant villain. The mayor of “The Wasteland,” a place void of color where Disney’s forgotten characters live. At first, Disney didn’t immediately know how fans and gamers would respond to the character, but felt it was a calculated risk. It was a gamble for Spector too, who made a living for nearly 30 years on cool RPGs such as "Ultima" and cyber-punk shooters the likes of "Deus Ex." His fans weren’t the Disney type, but he saw a golden opportunity to do something he’d never done before. Behind Spector’s vision, "Epic Mickey" was a resounding success, as it sold nearly 3 million copies worldwide. It not only reintroduced Oswald’s character, but it proved he was still marketable. “I knew that if we got through the first game that we’d have a great story for the second game,” Spector said. Spector got his wish in the recently released “Epic Mickey 2,” where, this time, Oswald isn’t the villain. Instead, he’s alongside Mickey the entire journey. 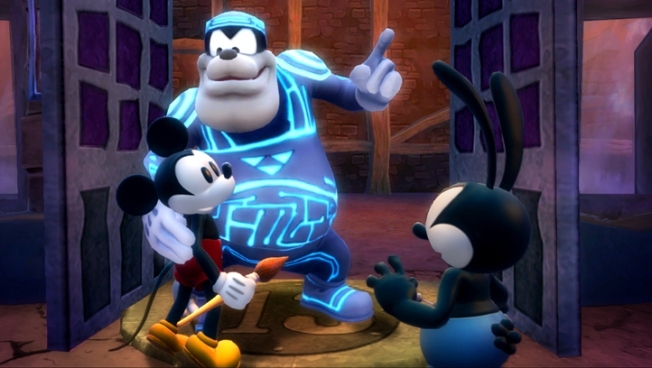 A different experience from the single-player experience of the first title, Oswald and Mickey work together to solve the game’s plethora of puzzles. With Mickey using his brush to "rebuild" the Wasteland, he needs the flying and electrical abilities of Oswald to get through many obstacles and enemies he encounters. Only together can they save Oswald's home from a new group of baddies. Powered by an original Disney soundtrack and clever design, Spector is happy with the end product. Spector knows that "Epic Mickey 2" isn’t for the same crowd that’s enjoyed his previous games or those who fancy "Halo 4." He especially knows those who watch Michaels on Sunday Night Football won't fall in love with his newest creation, but said it’s an experience many gamers will enjoy. If they give it a chance.